Nick Brummelkamp, above left, beat Brian Lam, right, in a close match, 3-6, 6-2, 3-4 (Ret.) 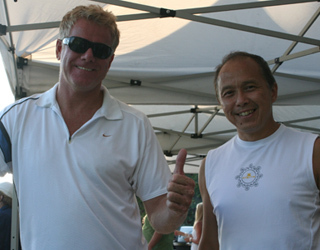 to win the final in the Men's 45 singles at the West Vancouver Tennis Club senior open, August 12-19. The popular event was a warm-up for the Senior Nationals in Toronto the following week. Photo 1 (left): John Wade is changing the score in the Men's 55 final. He topped Ian Stewart, 6-7, 6-3, 6-1, for the 2011 title. John fended off the top-seed, Doug Holman, 6-7, 7-6, 6-3, earlier in the semis. Doug went on to the National where he lost in the second round. Photo 2: Left to right, Court Brousson, Bruce Mann and Chris Stead. Court downed Bruce, 7-5, 6-2, in the Men's 70 Singles final. Photo 3: Thanks to Susan Stone, left, and her daughter Ali for making the players' reception highly enjoyable. Photo 4: Norm Allan, a tournament referee, and his dog overlook the courts! Men's 30 & 35 Singles: Stan Puskas (1) def. Steven Bower (2), 6-3, 6-2. Men's 75 Singles: Bob Seeley (1) def. Rudy Derton, 6-0, 6-1. Men's 70 Doubles: Ling / Lowe def. Jarman / Kimoto, 2-6, 6-4, 10-6. Men's 55 Doubles: Al Lawry and George Shaw won the round robin event. Women's 45 Singles: Carol Lau def. Marlene West, 6-2, 6-3. Women's 45 Doubles: Catliff / Reynolds (12) def. De Liefde / Dobie, 6-3, 6-1. Women's 55 Ewing / Wilcox def. Azim / McLachlan, 0-6, 6-4, 10-6.